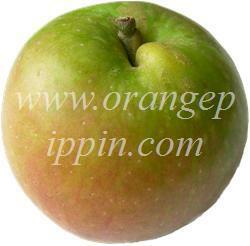 Northern Greening is a very old English apple, already widely-grown by the early 19th century. It was rated by the Victorian author Hogg as "an excellent culinary apple of first-rate quality" and it cooks to juicy puree. Whilst one disagrees with Hogg at one's peril, it is perhaps safe to say that its descendants have a better flavour when cooked. The true importance of Northern Greening lies in its historical significance, as it is the probable parent of Dumelow's Seedling which was in turn one of the most influential Victorian culinary apples. 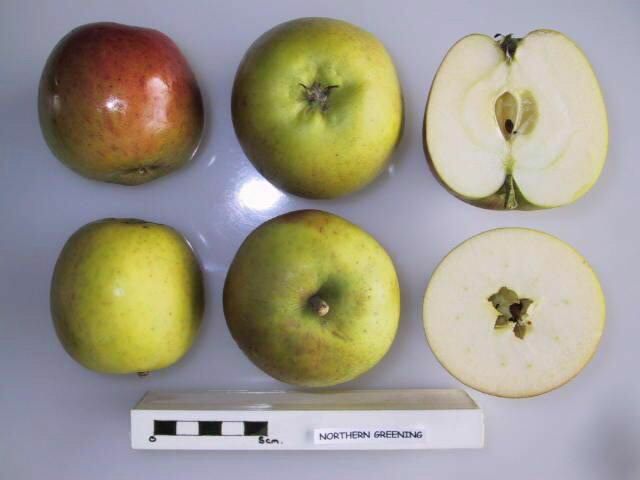 Northern Greening is in some ways a more "primitive" apple than other culinary apples of the Victorian era. It has a rather un-prepossesing appearance, and is smaller than the norm for a cooking apple. However it has the key qualities necessary in a cooking apple: it stores very well (a crucial attribute before the advent of refrigeration), it has a good acidic flavour (the base of all English-style apple cooking), and the tree is very reliable, disease resistant, and productive. These qualities, along with better size and visual appearance, are to be found in many of its descendants. I have been driving 2 hours to the NC/VA area to purchase Northern Greenings. It is the only place I have found them. It is the very best apple I and my grown kids have found for dried apples. They keep their color without treating and are so wonderful tasting when dried. There is no better or more healthy snack. This(the greening) is one of my childhood favorites. Crunchy and tart for eating (the kind of apples I like) and does make superb sauce and pies. The tree we pick from has been in my family for 50+ years and is a great producer. When in cold storage the apples last for months before losing integrity then you just make sauce. Great apple! The greening has long been a favorite in our family for making pies. Oh, sure. The Granny Smith's are all the rage these days, but the firm, tart greening makes a much better pie. A bit hard for just eating though. I am not 100% certain that this is a Northern Greening but my source who worked for USDA for many years thought it was. This tree is probably 10 years old and this is the first year that the fruit was outstanding. It makes wonderful apple sauce and pies.